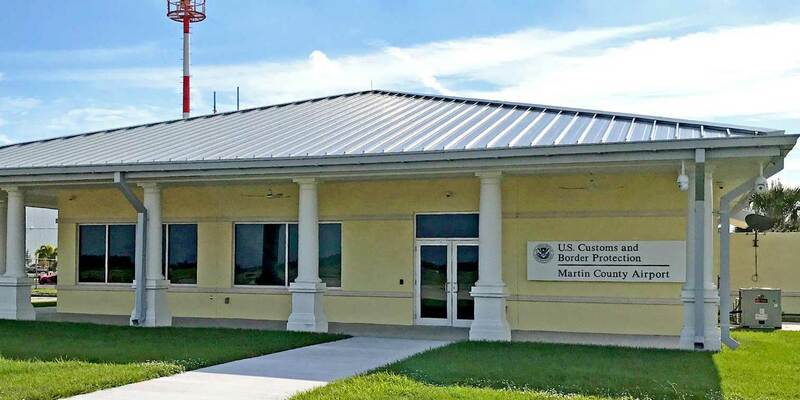 The new U.S. Customs facility in Stuart is a first of its kind for Florida, with the ability to process both air and sea passengers. Starting today, arriving international flights will be able to be cleared at Florida’s Martin County Airport/Witham Field in Stuart, with the opening of a new, stand-alone U.S. Customs facility. The culmination of nine years of planning, the 3,210-sq-ft structure is the first intermodal clearance facility of its kind in the state and will allow pilots, boaters, residents, and visitors to the city to be processed without having to first travel to Fort Pierce or West Palm Beach. The project, funded through an 80/20 grant partnership with the Florida Department of Transportation Aviation (Multimodal) Division and the Airport Enterprise Fund, will rely on user fees to cover the cost of operations, with fees ranging from $30 for a single-engine piston aircraft to $500 for a heavy jet. It will operate daily from 11 a.m. until 7 p.m., except when it is closed on Tuesday and Wednesday.